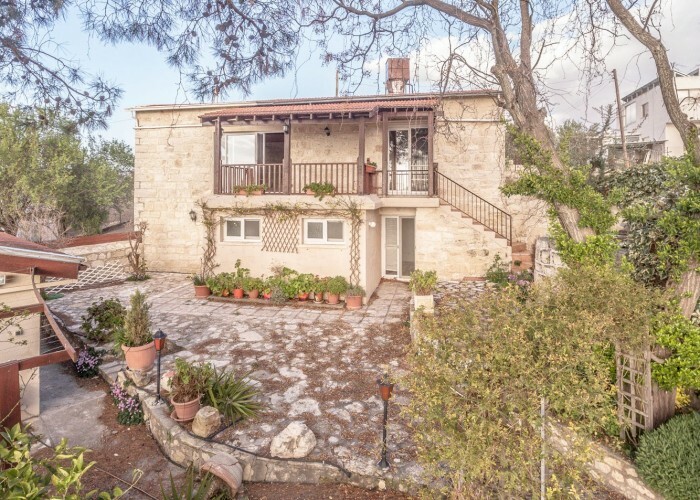 This delightful, character, 3 bedroom stone houses with large private garden, is located on the edge of the Paphos forest in the charming village of Ayios Dimitrianos, near Polemi. If one is looking for peace, tranquility and stunning views then this HAS to be THE place. With the town of Polis 20 minutes drive away, the beaches and water sports of Latchi 25 minutes, and Paphos town 20 minutes by road, this is an ideal location. A coffee shop is 5 minutes walk away in the village and local shops are in the next village of Polemi, 5 minutes drive away. The house is set on a large plot of 1050m2and offers stunning views across the hills towards the west and the Akamas peninsular. The grounds of the house are entered via double wooden gates which lead into a small courtyard. To the right of the courtyard is a small building. but could quite easily become maid’s quarters. Bear in mind that this is an older style house so the construction is different to that of more modern properties. For example the stone walls are 2 feet thick and are fully insulated. The advantage of this is that the house stays cool in the summer and warmer in the winter. Don’t forget that this property is way above the humidity level. Once through the front door one is immediately struck by the wood finished floors and ceilings. Turn right after entering the property and one comes into the lounge. A feature of the lounge which is immediately apparent is the fully functioning wood burner. The lounge then leads into the very generously sized dining area. 2 sets of patio doors lead from the lounge diner to the west facing patio, and it is from this patio that the fantastic views can be best enjoyed. We mentioned earlier how quiet and peaceful this area is, so try to imagine sitting on this patio on a summer’s evening enjoying a drink, watching the sun going down over the Akamas peninsular and then once the sun has set looking up at the abundance of stars in the western sky. There is so little light pollution here that constellations can easily be picked out here without the need of a telescope. The lounge then leads into the very large kitchen. The kitchen also includes a double sink and large amounts of drawer and cupboard space. A guest cloakroom completes the rooms on this floor. This is an UPSIDE DOWN house so a spiral staircase leads down to the 2 bedrooms. Both of the bedrooms are generously sized doubles and both are en suite. One with an en suite bathroom, and the other with an en suite shower room. Doors lead from both bedrooms to the downstairs patio and into the garden area, and steps also lead from the upstairs balcony to the garden. In the entrance courtyard is another room that can be used as a third bedroom. Now this garden area really is something to behold. The garden area immediately in front of the balcony is covered with attractive plants and shrubbery and to the left of the garden a path leads into an ORCHARD including fruit trees of several species, including apple, pear, various citrus, and plums, and the 14 olive trees that have yielded between 150 and 400 kg of olives, from which the owners have obtained from 20-70 litres of oil a year. Additionally, there's over €2,000 worth of irrigation equipment and piping, which provides for the growing of lots of vegetables in the orchard as well as keeping the trees and flowers in good health. There is also a lockable garage which can be accessed from both the road and via a door in the garden. Stone finishes are noticeable throughout the grounds with the numerous stone walls being most apparent and it is these that denote the boundaries of the plot.